Many vision tasks such as scene segmentation, or the recognition of materials within a scene, become considerably easier when it is possible to measure the spectral reflectance of scene surfaces. In this project, we present an efficient and robust approach for recovering spectral reflectance in a scene that combines the advantages of using multiple spectral sources and a multispectral camera. We have implemented a system based on this approach using a cluster of light sources with different spectra to illuminate the scene and a conventional RGB camera to acquire images. Rather than sequentially activating the sources, we have developed a novel technique to determine the optimal multiplexing sequence of spectral sources so as to minimize the number of acquired images. We use our recovered spectral measurements to recover the continuous spectral reflectance for each scene point by using a linear model for spectral reflectance. Our imaging system can produce multispectral videos of scenes at 30fps. We demonstrate the effectiveness of our system through extensive evaluation. As a demonstration, we present the results of applying data recovered by our system to material segmentation and spectral relighting. This is a joint project with Jong-Il Park and Moon-Hyun Lee from the Mixed Reality Laboratory at Hanyang University, and Michael Grossberg at the City University of New York (CUNY). 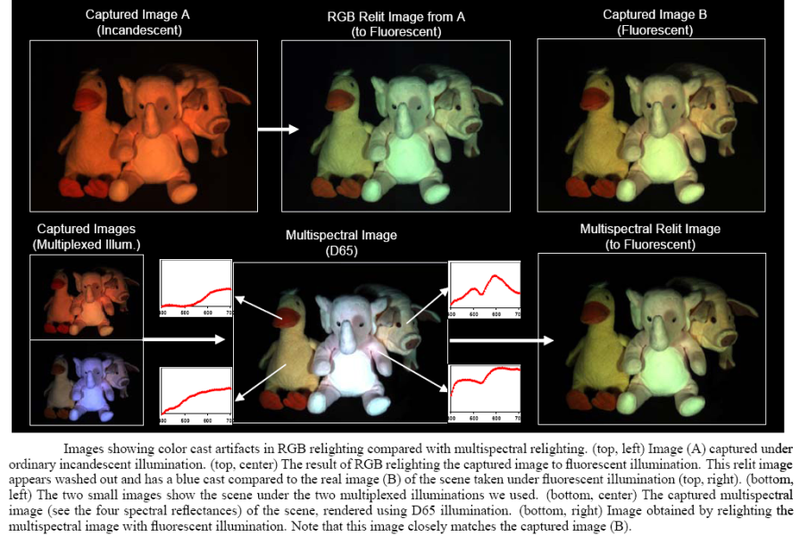 "Multispectral Imaging Using Multiplexed Illumination,"
The scene is lit with a set of distinct illuminations and a synchronized RGB camera captures the corresponding images. By using rapidly changing multiplexed illuminations and processing the acquired video, we obtain a multispectral video of the scene. 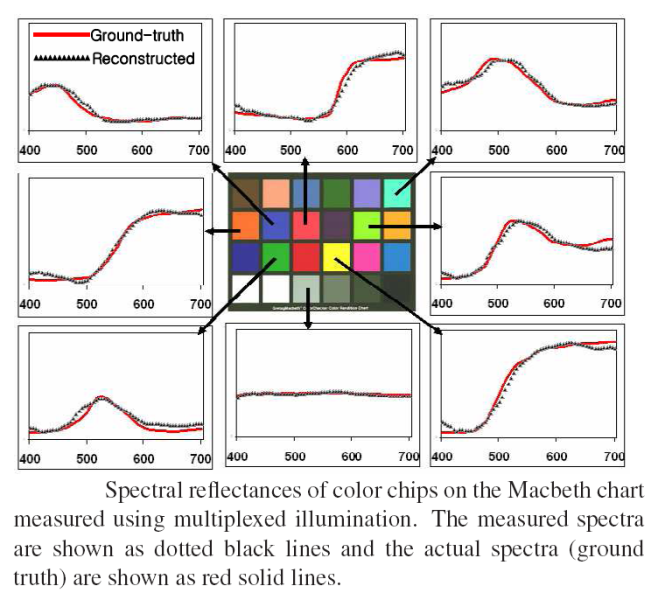 Spectral reflectances of color chips on the Macbeth chart measured using multiplexed illumination. The measured spectra are shown as dotted black lines and the actual spectra (ground truth) are shown as red solid lines. 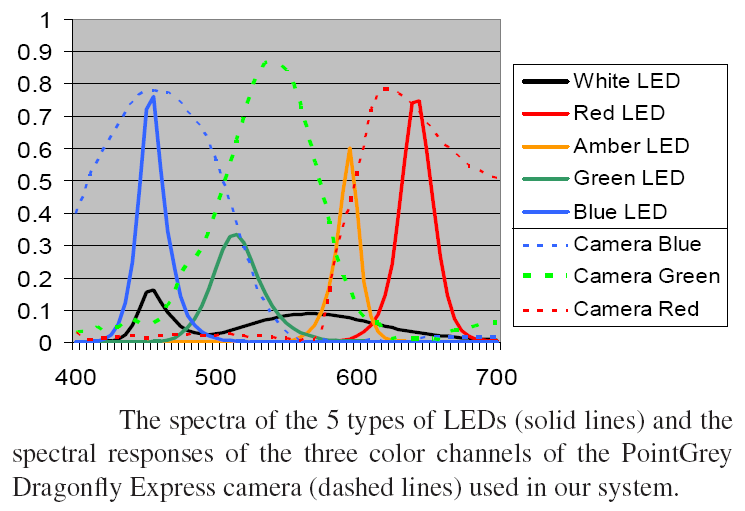 The spectra of the 5 types of LEDs (solid lines) and the spectral responses of the three color channels of the PointGrey Dragonfly Express camera (dashed lines) used in our system. 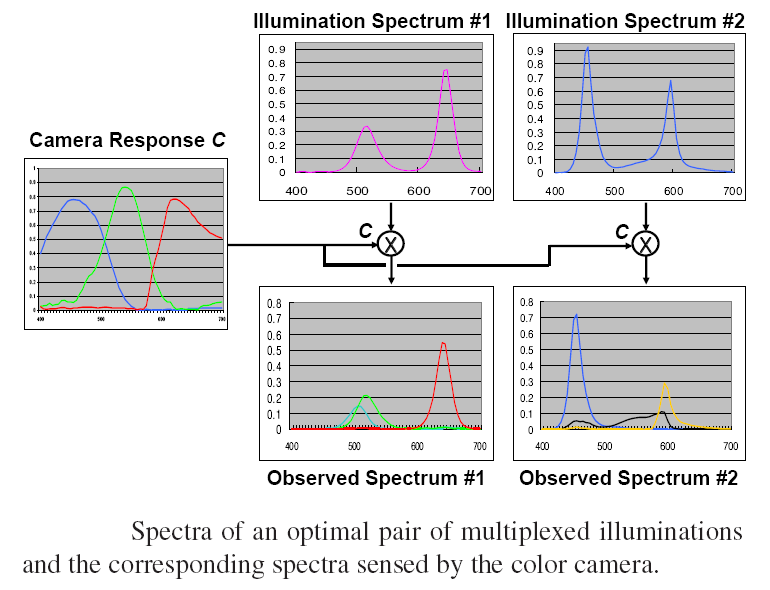 Spectra of an optimal pair of multiplexed illuminations and the corresponding spectra received by the color camera. Images showing color cast artifacts in RGB relighting compared with multispectral relighting. Images showing color distortion artifacts in RGB relighting compared with multispectral relighting. Images comparing RGB and multispectral relighting applied to a scene with three real fruits (on the right) and a printed image of the same fruits (on the left).